Immutrition Package - Combining the immune system with nutrition. To survive in today’s world with a quality life we must have balanced nutrition to provide needed nutrients plus a properly functioning immune response to protect us from what seeks to harm and destroy our health. Add air to provide oxygen essential to breathing and the provision of oxygen plus nourishing clean water to hydrate and lubricate our bodies. For nutrition we need a balanced diet providing in correct balance and composition the proteins, fats and carbohydrates demanded by our bodies, together with minerals and enzymes. Proper digestion to convert our food into energy is a must. 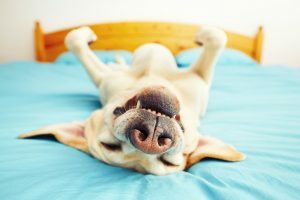 We also need adequate sleep and moderate exercise to keep our bodies in a condition necessary for carrying on the needed functions of everyday life. As to quality water and clean air, these you must acquire on your own, but both are readily available at a minimum expense and effort. Exercise and sleep are personal lifestyle items that can be programmed into almost all lives in adequate amounts, but we seldom respond with adequate amounts of either. Then there is nutrition wherein most of us know what we should eat and how much, but the great majority fall far short. Nutrition is a basic component of an immune response as your health-shield defense, joined with moderate exercise, adequate sleep and stress management. If you are in the high percentile, probably 90%+, of the human race who come up short on doing what you need to do, you need to augment your lacking efforts with quality and safe nutritional supplements to fill in the gaps required for the healthy lifestyle you seek. 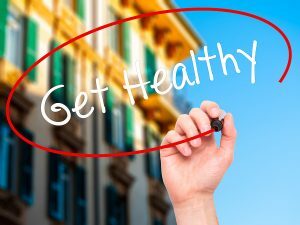 The two areas most easily addressed by safe nutritional supplements are your immune response and your nutrition – thus the clever name IMMUTRITION to describe a quality nutritional supplement package to meet many of the deficiencies in your lifestyle associated with the immune response and nutrition. The Nutritional Scientific Corporation (NSC) gave intense thought to meeting the criteria and have created the NSC IMMUTRITION Package to fulfill the needs of most where we fail ourselves. Since most of us don’t eat, sleep or exercise right, we need a nutritional immune boost to seek to keep our immune cells optimized and normalized. Thus to help our immune cells recognize, respond and resolve health challenges, the NSC-24 Original MG Beta Glucan – 30 Ct is a member of this elite supplement team. NSC MG Beta Glucan is an extensively medical school researched immune enhancing product to be taken daily. 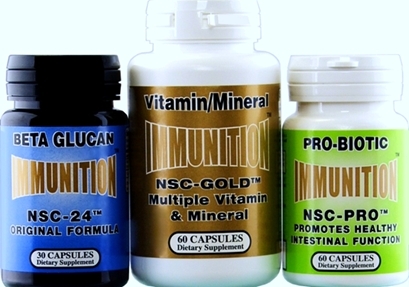 All three NSC IMMUNITION Products at a huge 40% Discount at just $44.95 (retail $74.85). To purchase the NSC IMMUTRITION Package just click on “Buy Now” below. To comment or obtain more information email nsc24@nsc24.com or call 888-541-3997. For detailed label and content information, click on an individual product above and then on Supplement Facts. Nutritional Scientific Corporation© 2017-2018 All rights reserved.